On any other day of the year, you might write this off as sentimental schmaltz. But hey! It's Christmas eve—a day when the fact that hundreds of architecture students actually designed Santa's logistics center is actually pretty fun. 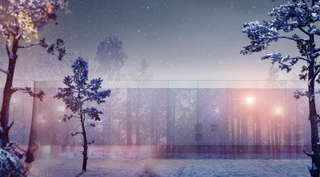 Almost 250 designers submitted plans and renderings of their vision for Santa's "logistics center," as part of a competition run by Helsinki Design Week and the Finnish construction company Ruukki. The winning proposals are completely void of any ties to the real world, and a grinch would probably call them deeply corny, but let's hold our cynicism for the 26th and just appreciate that this many people actually took the time to plan this building out. The winner, by Romanian architects Alexandru Oprita and Laurentiu Constantin, is "a building that is invisible at daytime and becomes visible when night comes—just like Santa," thanks to two-way mirrors and a series of facade projectors that turn the mirror into a screen at night. Inside is a full-blown logistics center of which Amazon would be jealous. Meanwhile, Urszula Chomiak and Pawel Potemkowski imagine Santa's HQ as a gift to the local community in the far north of Finland—so they edged the shipping center with a gigantic public ice climbing wall. "Mr. Santa Claus is a responsible person, who cares about people and tries to make the world a better place," they write. "On the other hand, building typical logistics centers can be harmful to urban environment. But what if it becomes a gift for citizens?" You can check out the full list of runners-up here.